*** SCHÖNES DESTIN ***. Kostenloser Strandservice ..
Sie sind eingeladen zu unserer "Ecke des Himmels" an den schönsten Stränden der Welt. Southbay am Golf ist eine Gemeinschaft von privaten Stadthäusern. MEHR Kochgeschirr als Sie jemals verwenden möchten. Während Ihres Besuchs, Sonne und Schwimmen, flanieren Sie die schöne Anlage, genießen Sie Tennis, oder füttern Sie die Enten und Schildkröten in unserem 5 Hektar großen Süßwassersee (Sie können auch fischen) SO, bringen Sie Ihre Strandtücher und treffen Sie jemanden besonderen in unserem Gazebo und genießen der schöne Sonnenuntergang auf Destins großartigen smaragdgrünen Wassern. Very dated. Could have been cleaner. It was alright. There were stains on the sheets, the master comforter had some kind of crud on it. Sheets didn’t fit the bed. Bathroom could’ve been cleaner. The shared bathroom was stopped up. We called an left a message with maintenance, they didn’t call back. There was no DVD player as listed in amenities. Overall very dated and we didn’t feel clean. This home rental is perfect for anyone with children. The pool is right out the back patio and a bridge for fishing is right out the front door. We would definitely come back. Property is older but clean. The townhouse is just steps from magnificent sand on Destin Beach. It was built several decades ago, but clean and quiet. Small plumbing issue was repaired in just few minutes by a maintenance man. We enjoined our stay very much. Thank you for taking time to review your stay. Yes, our townhouses are very unique and so few remain in Destin. Our small complex is very pleasant, quaint and quiet. Being able to park at your door and unload luggage and groceries is a luxury newer high rises do not and cannot offer. Being just steps from the beach is another uniqueness we can offer our guests. Hopefully your review will give future guests confidence to book with us. The property was beautiful and so perfectly located. The pool was right out our door and the beach was just a few steps away. The beach chairs and umbrella were very nice to have. We couldn’t have asked for anything better. There was everything we needed right down to a closet of water toys. We will definitely be booking with Judy agsin. I’ve already recommended this property to friends and family. Thank you for a wonderful stay. Thank you, Kim, for taking time to review our property. So glad you enjoyed your stay and said such wonderful compliments.. We try very hard to make vacation perfect for our guests. Our future guests will not hesitate to book with us.. While it wasn't directly on the beach, we knew that when we booked. The townhouse was a lot larger in person than it appears in photos. There was plenty of room for all of us! We had everything we needed and it was nice being in a townhouse, being able to walk in/out with no elevators or stairs involved. Would definitely stay again! Thank you for the great review. Future guests will feel at ease booking our property when they read your nice words. Thanks again. Had a wonderful time - very relaxing. Judy Parsons is wonderful to work with - pleasant and quick to respond. We were overjoyed that the pool was right outside our back door and the short walk to the beach was ideal. The young man who was in charge of the umbrellas and chairs was right on spot and so friendly. The inside of the condo was as pictured and there was plenty of space for the seven of us. Few minor hiccups but nothing that we couldn't live with. If I could add anything to this unit it would be an additional TV in the 3rd bedroom and also a small gas/charcoal grill for the patio - otherwise it was great. Thanks for letting us stay and enjoy the beautiful white sand and clear, clear waters of Destin. So glad you enjoyed your stay in our townhouse. 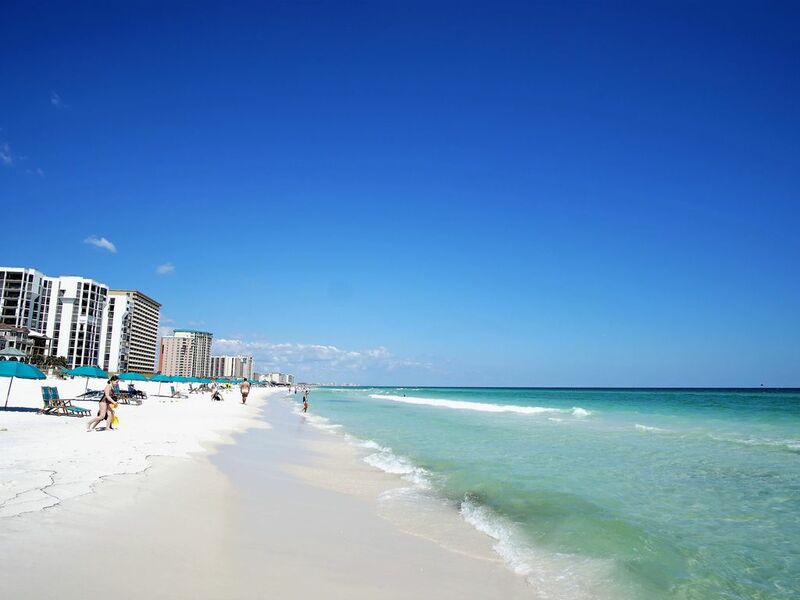 Destin is beautiful and our townhouse is so convenient to many enjoyable things and of course the beautiful beaches with great Complimentary Beach Service.. This is helpful for our future guests. Thank you for your input to help make our townhouse even better. We are planning another TV in the extra bedroom this fall.